Photograph 1 - View of "The Neck" near the entrance to Canyonlands National Park, Utah. On both sides of the road is a very steep drop. 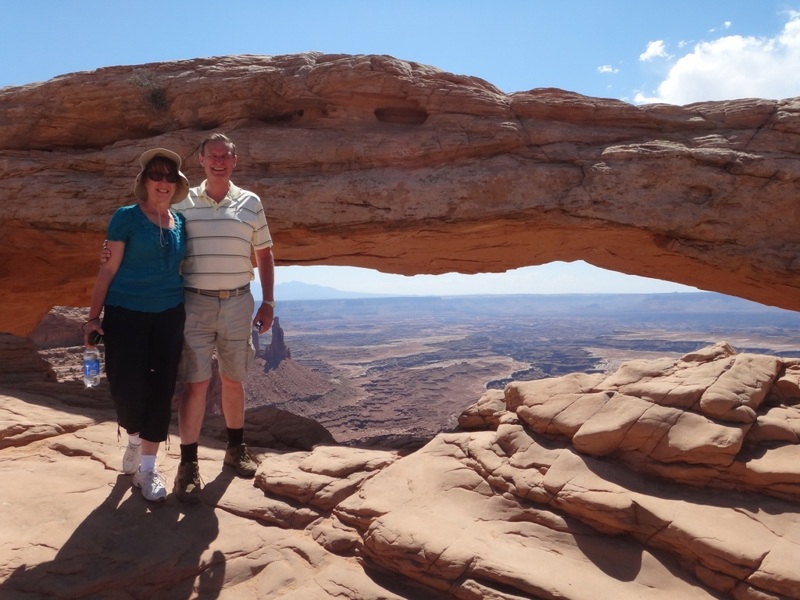 Photograph 2 - Anne and Connie at Shafer Canyon Overlook inside Canyonlands National Park, Utah. 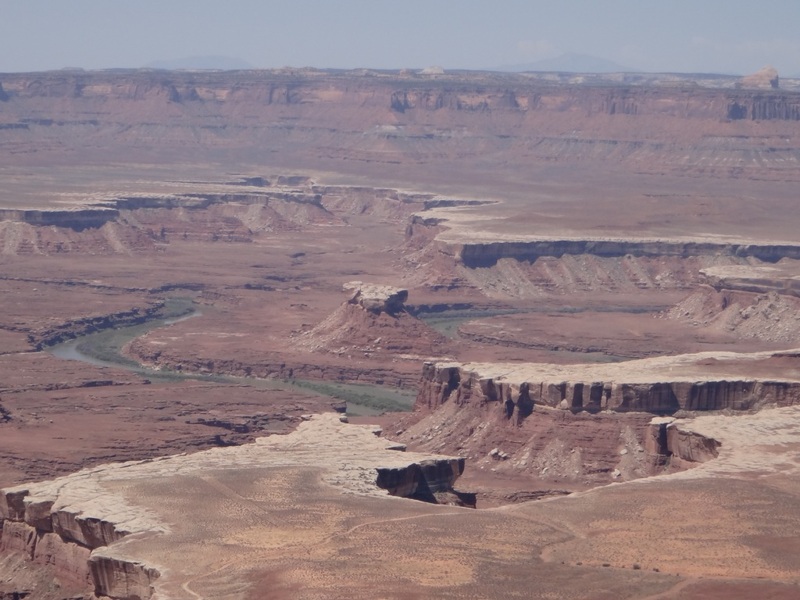 Photograph 3 - Panorama view of the Colorado River side of Canyonland National Park. This picture was taken on top of Mesa Arch. Photograph 4 - The right hand side of the Mesa Arch - note the sheer drop into the canyon - a neat 1000 feet fall if one decides to jump over. 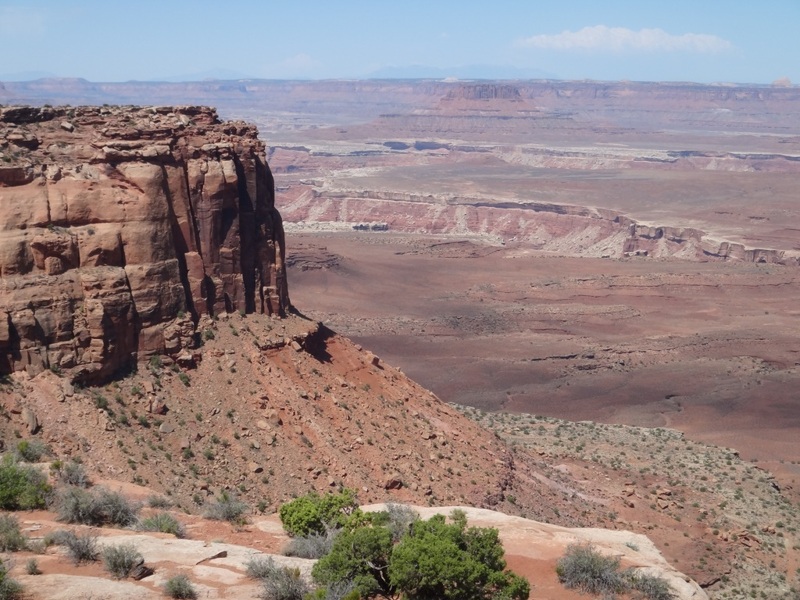 Canyonland National Park, Utah. Photograph 5 - You guessed it - it's us in front of the Mesa Arch, Canyonland National Park, Utah. Photograph 6 - The view south taken from the Grand View Point Overland at the end of the Canyonland National Park road. The view from here is magnificent where the Green River meets the Colorado River before the later takes its next journey to the Grand Canyon. Photograph 7 - View from the Green River Overlook inside the Canyonland National Park, Utah. 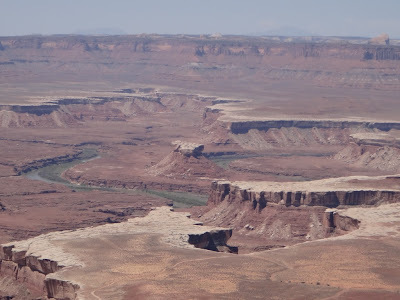 Photograph 8 - Zoomed photo taken of the Green River inside the Canyonland National Park, Utah. Photograph 9 - These buttes are called Merrimac and Monitor. Taken inside the Canyonland National Park, Utah. Why would the Americans call these features Merrimac and Monitor???? Please sent us an email your answer if you know? 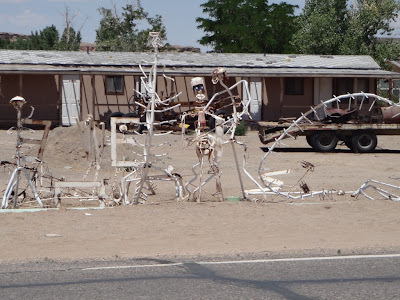 Photograph 10 - Strange artwork in Hanksville, Utah. This town is out in the never-never and many buildings are deserted. Photograph 11 - Interesting rock formation near Hanksville, Utah. 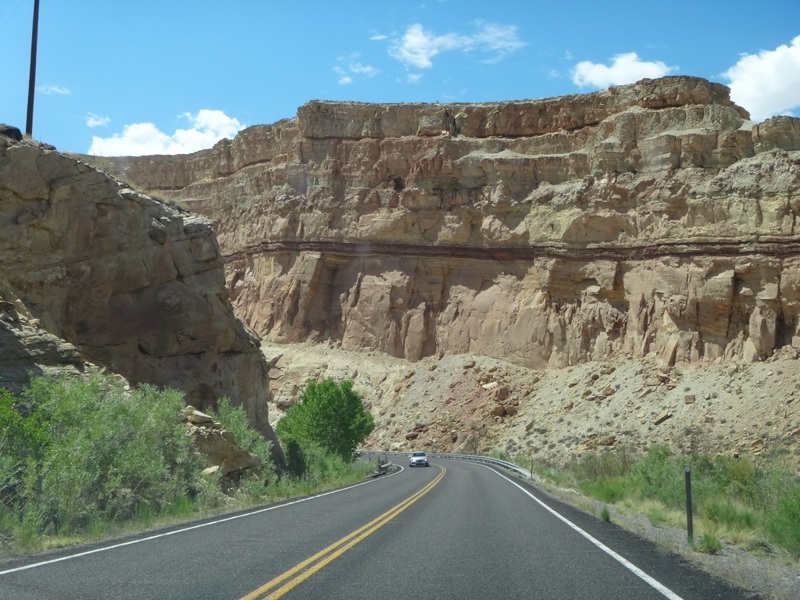 Photograph 12 - Entering the Capitol Reef National Park, Utah. Note the deep red horizontal fault line. 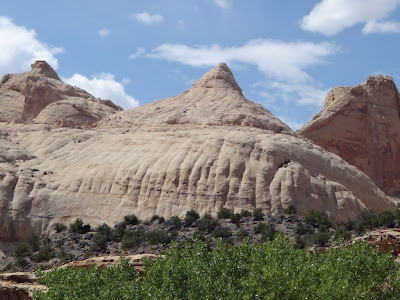 Photograph 13 - The Navajo Dome, Capitol Reef National Park, Utah. 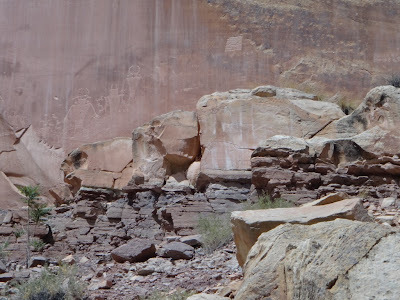 Photograph 14 - Petroglyphs on the canyon walls inside the Capitol Reef National Park, Utah. Photograph 15 - Panorama view of the western end of the Capitol Reef National Park. We see this view from our overnight accommodation at Torrey. Note the many different colours of the features - a really awesome view. Photogragh 16 - Not for those who are passionate regarding the preservation of snakes. 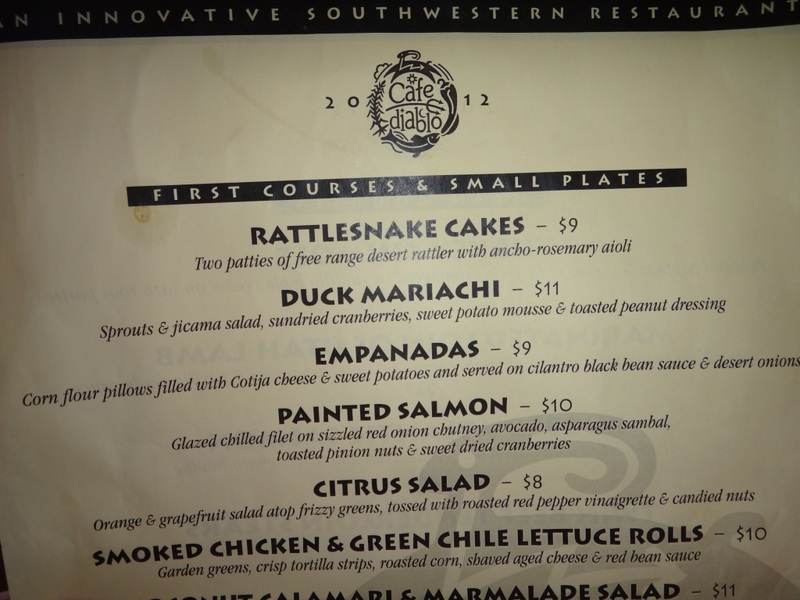 Rattlesnake Cakes on the menu!!! The famous dish offered in the Cafe Diablo, Torrey, Utah. 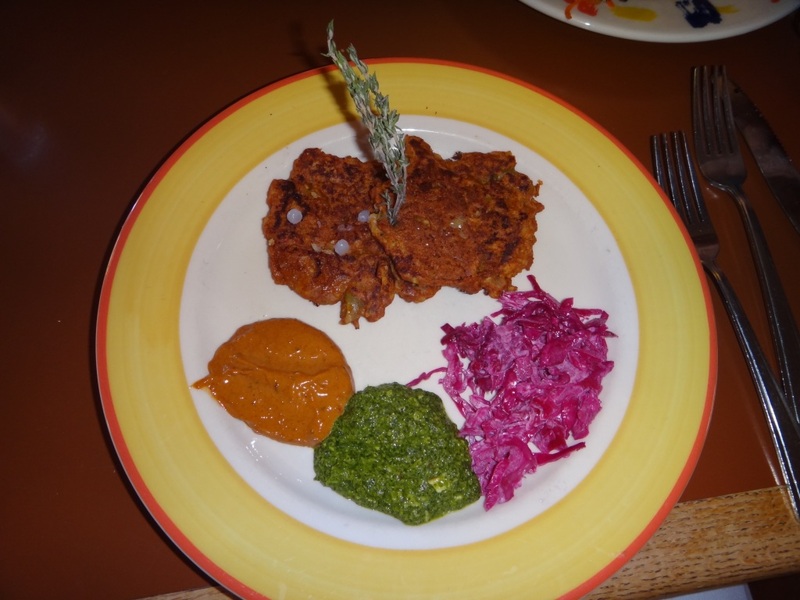 Photograph 17 - This is it - Rattlesnake Cakes with different sauces. Not much to write about today - the above photographs say it all. 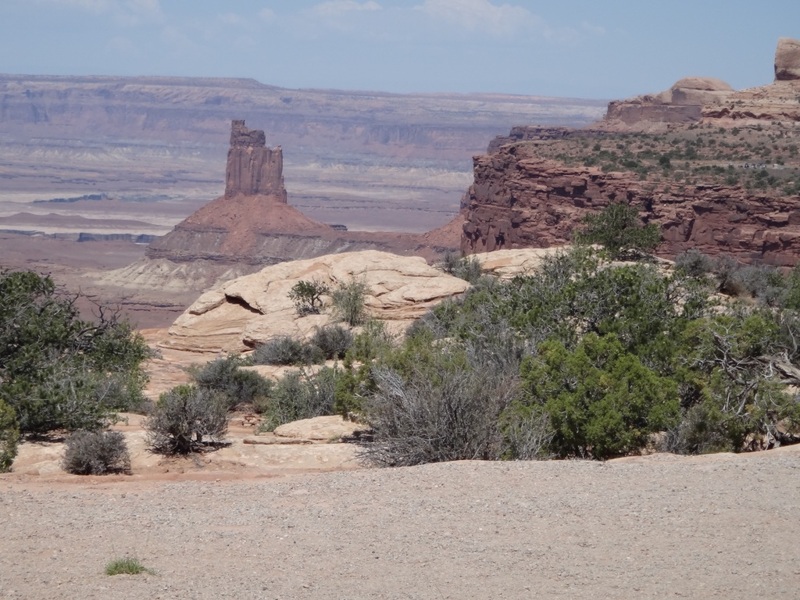 We left Moab, Utah at 9:15 headed north direct to the Canyonlands National Park. By now we are almost canyoned-out, however when we see the unusual and individual features it is a different story. 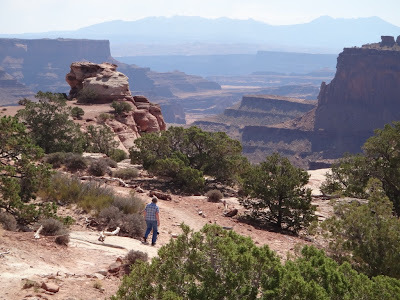 The Canyonlands, so the rangers tell us, is you are on the "Island in the Sky". You pass a very narrow neck and onto a plateau. From three sides there is a sheer drop into the void. 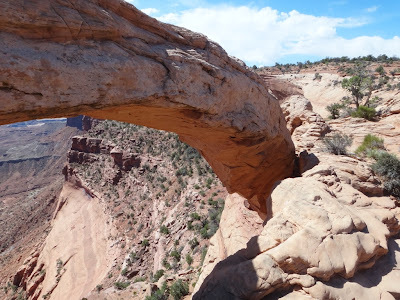 One such viewpoint is the Mesa Arch. Neil stood on top of this arch and a 1000 feet drop was just within a metre away. Continuing from Canyonlands we drove to the Capitol Reef National Park passing through Green River township for a picnic lunch in the lush park. The countryside around this town is completely deserted (no trees - but only rocks and sand). However the Green River passes through this town and an oasis is created. Beautiful green grass and all the trappings of a fertile district. Damn if we know what residents do for a living here? 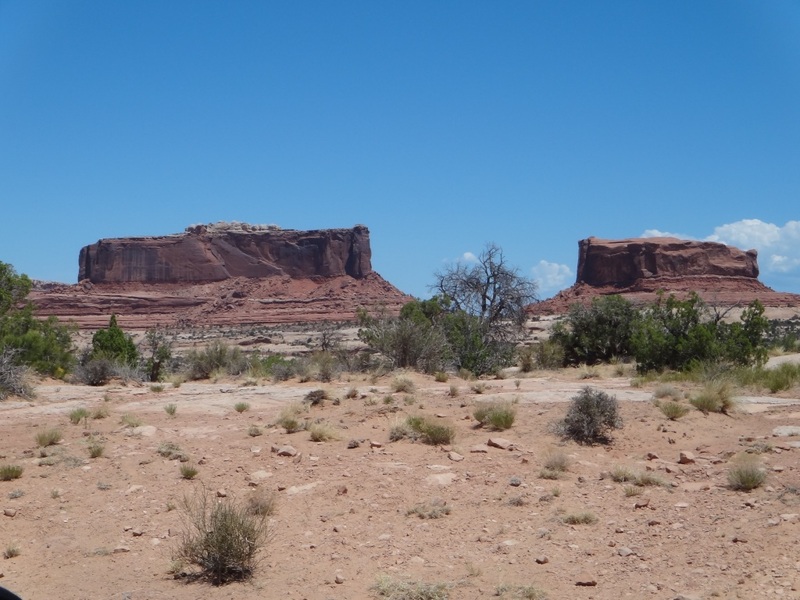 We passed through a town called Hanksville and it is almost deserted. There were at least six motels in the town but now they are deserted and in ruins. Only one motel is alive and that is not in a good shape. 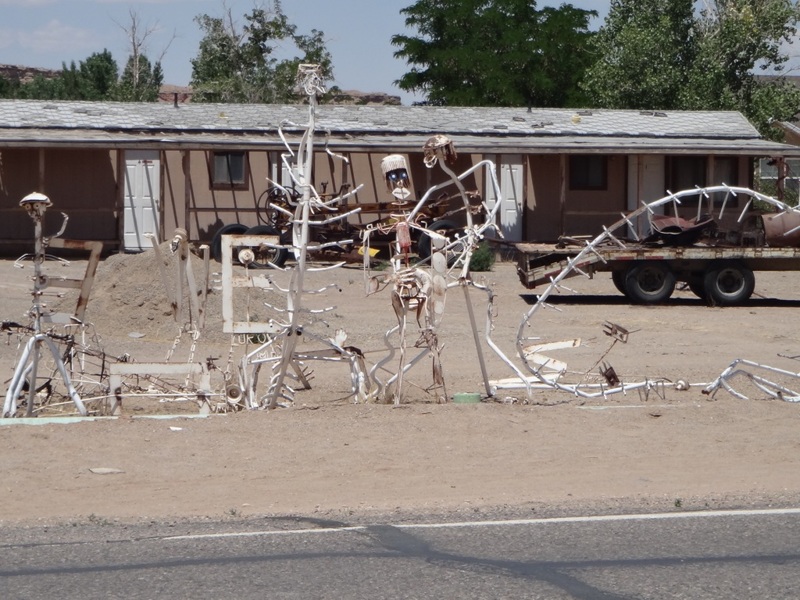 There was some artistic person who had place all sorts of metalwork in front of his or her motel - all welded parts from vehicles and pushbikes that look like skeletal remains (see picture above). 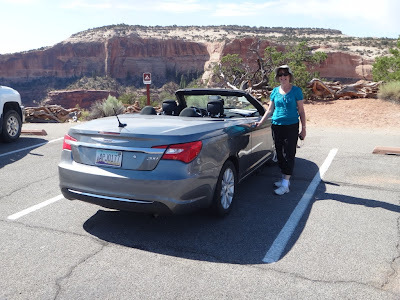 Going through the Capitol Reef National Park was free - no toll booths. 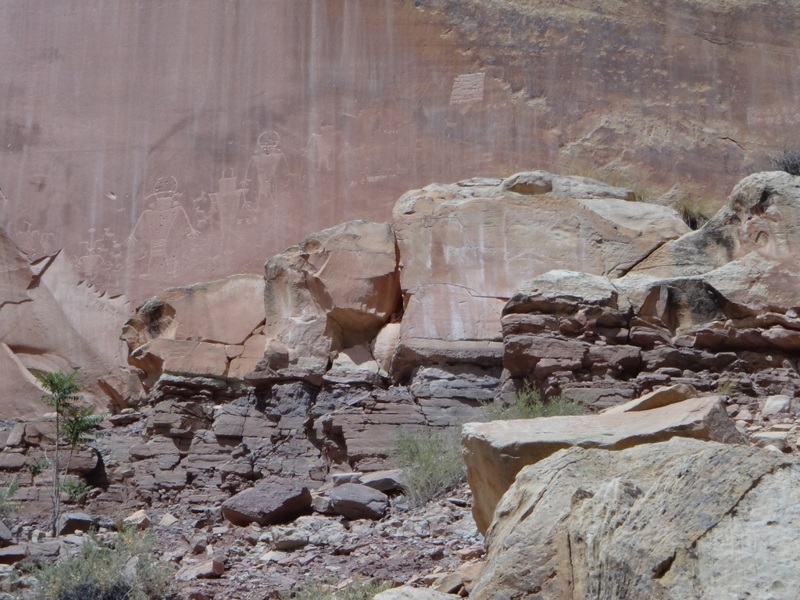 The park is famous for its unusual rock formations and petroglyphs (Indian rock drawings - or should we say old graffiti)? 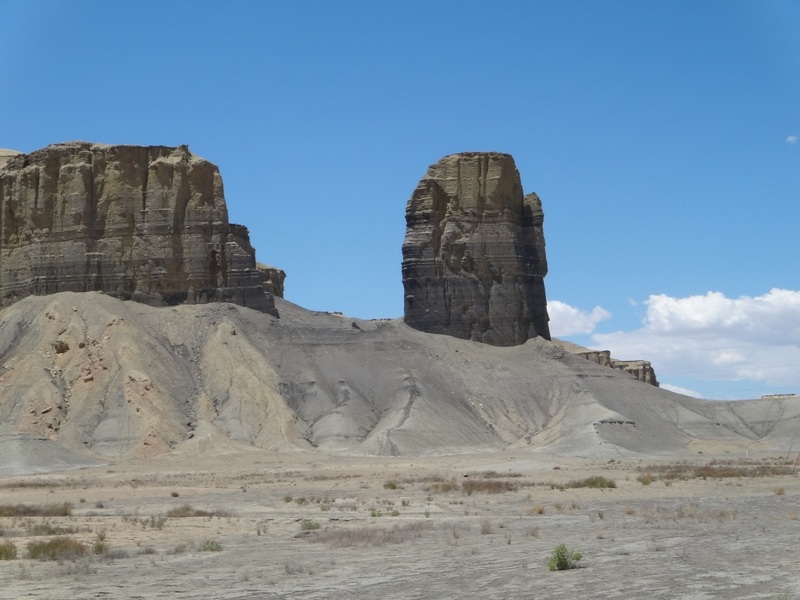 On the western end of the park is a magnificent view of formations that emanate different colours. After we took photographs we discovered that our accommodation (Best Western Torrey) was located within a mile away. When we checked-in we were upgraded gratis to a suite because we were international visitors. Now Torrey is not a town but a village. It is very pretty in such that there are trees that canopied the main drag and the town is like an oasis in the desert. We had read from the Lonely Planet book that a visit to Cafe Diablo is highly recommended - especially for those who want to try their Rattlesnake Cakes. We did just that. Neil had the cakes and Anne had the local trout. We could say that this has been the best meal of our holiday so far. To some eating rattlesnake maybe different and perhaps unpleasant but while you are in Rome do as the Romans do (a rather bad rhetoric). Tomorrow we travel further deep in Utah territory and staying at a town called Ruby's Inn. This is another small village near the Bryce Canyon National Park. This will be our last canyon visit before our journey north to Wyoming and Montana. Cheers.